Get this …After a high-school career in which he went 24-4 with a 0.87 ERA and was named Pennsylvania Baseball Player of the Year two years running, Stanford’s Mike Mussina has posted a 7-1 record this season with five complete games and a two-hit shutout to his credit. He is also 4-0 in the Pacific 10 Conference Southern Division, thought by many to be the nation’s most formidable league. Okay, so here’s the joke. Mussina claims he turned down a six-figure contract to turn pro because … are you ready? He says he wasn’t mature enough. Somebody had better tell Mike to cut the gag. The 6-foot-2, 180-pound freshman from Mountoursville, Penn., has to be one of the most precocious hurlers ever to lay down his knapsack on the Farm. There you have it: he’s a regular world-beater. But if you question him about it, he will stick to his story with a deep-eyed, earnest, mature response. Pro ball may have been ready for him, but he wasn’t ready for pro ball. Well, let’s give Mussina the benefit of the doubt, for Stanford has all the evidence of being “the right thing.” He likes the wide-open campus and the moderate number of students, where “you’re a person and not a number.” But above all, Mussina likes the two-fold edcuation athletes get at Stanford — on the field, and of equal importance, in the classroom. So, while most Stanford students complain about paying $15,000 for a year of education at Stanford, Mussina paid $300,000 – the amount of the signing bonus he turned down from the Baltimore Orioles organization — to get his partial scholarship to Stanford. Of course, in return for that large payment comes the tutelage he needs to fine-tune his pitching. 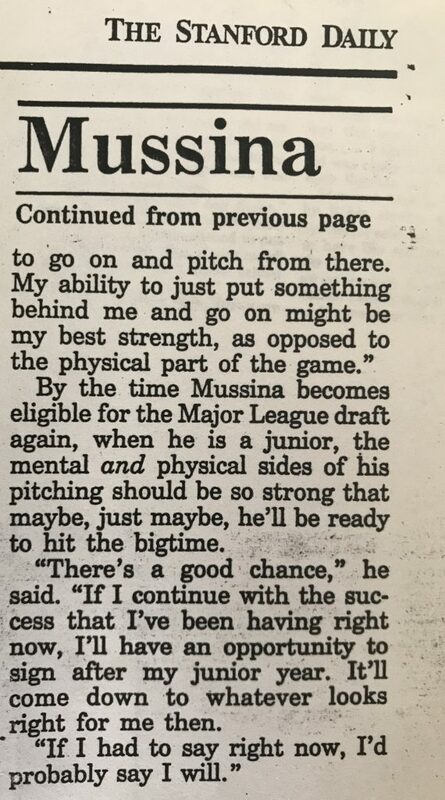 For starters, Mussina feels he has to develop his other pitches besides his out-pitch, the fastball. Problems with location help explain the team-leading 13 home runs Mussina has given up. 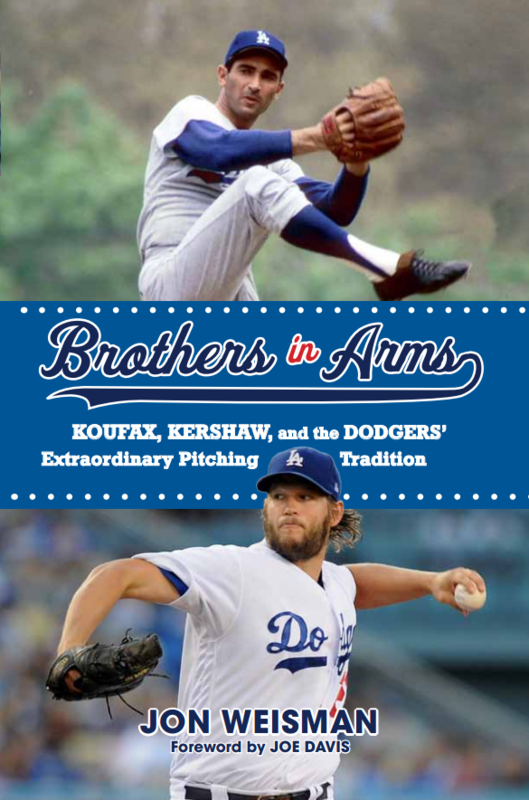 He can no longer simply blow his fastball past hitters as he did in high school. Nevertheless, the home-run totals don’t concern Dunton, especially since only four of the 13 have come with men on base. In fact, Dunton paid Mussina the highest of compliments when he said that Mussina compares favorably with McDowell, the former Stanford All-American and current Chicago White Sox phenom. So, Mussina is learning his lessons well. He has also been teaching a few lessons himself — to opposing batters. Mussina has won seven straight games since suffering a narrow, opening-day 3-2 loss to Santa Clara, and boasts a three-to-one stirkeouts-to-walks ratio. Obviously, the fact that he’s still learning about pitching hasn’t slowed him down. But there is one aspect of his game that needs no instruction — the mental side (i.e., maturity). 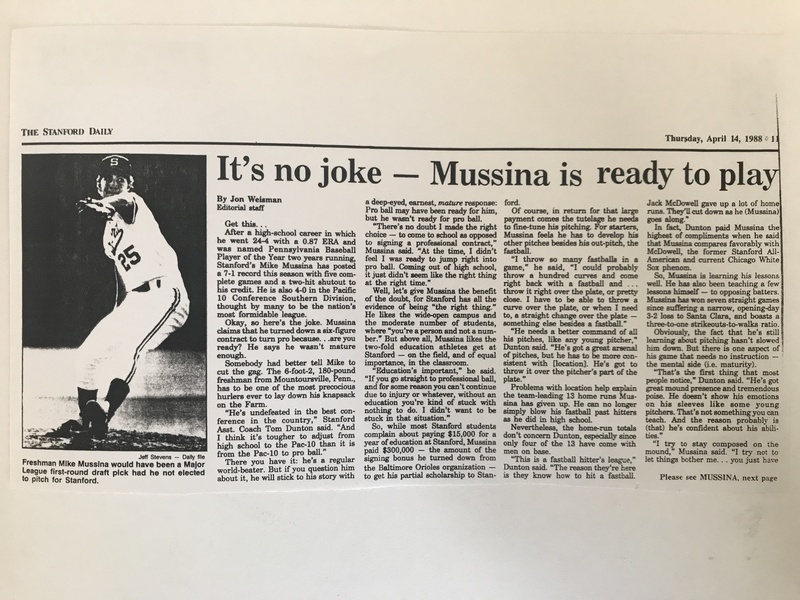 By the time Mussina becomes eligible for the Major League draft again, when he is a junior, the mental and physical sides of his pitching should be so strong that maybe, just maybe, he’ll be ready to hit the bigtime. “There’s a good chance,” he said. “If I continue with the success that I’ve been having right now, I’ll have an opportunity to sign after my junior year. It’ll come down to whatever looks right for me then. Not exactly Jim Murray, I know. But I still turned pro the next year. As for Mussina, he completed his degree in economics at Stanford in three years, and was drafted after his junior year — again by Baltimore — in the first round. He reached the majors at age 22 and had an 18-5, 2.54 ERA All-Star season at age 23.